We have the potential for a major snowstorm this weekend. My live blog will cover information on the storm potential with updates as new information comes in. 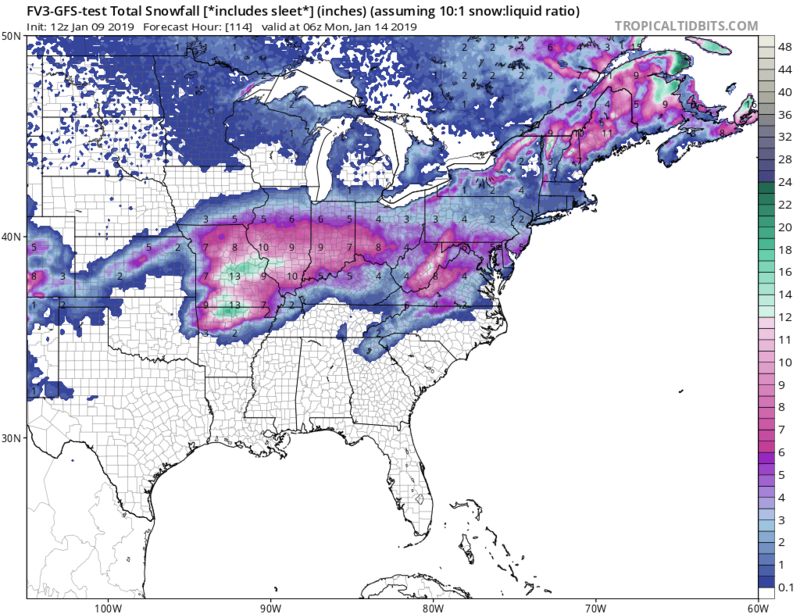 4:00pm Thursday January 9, 2019 – It’s fairly clear that Missouri to The Dalmarva will see the major snows with a general 1-6 inches of snow in the swath with parts of Missouri having up to a foot of snow. The models are all in good agreement on the location of snow but I still think that the error in some of the models in the amount of snow in NYC and Philly. I still think it’s 1-3 in NYC and 3-5 in Philly. Baltimore and Washington will see 1-6 inches of snow depending on the north-south locations. 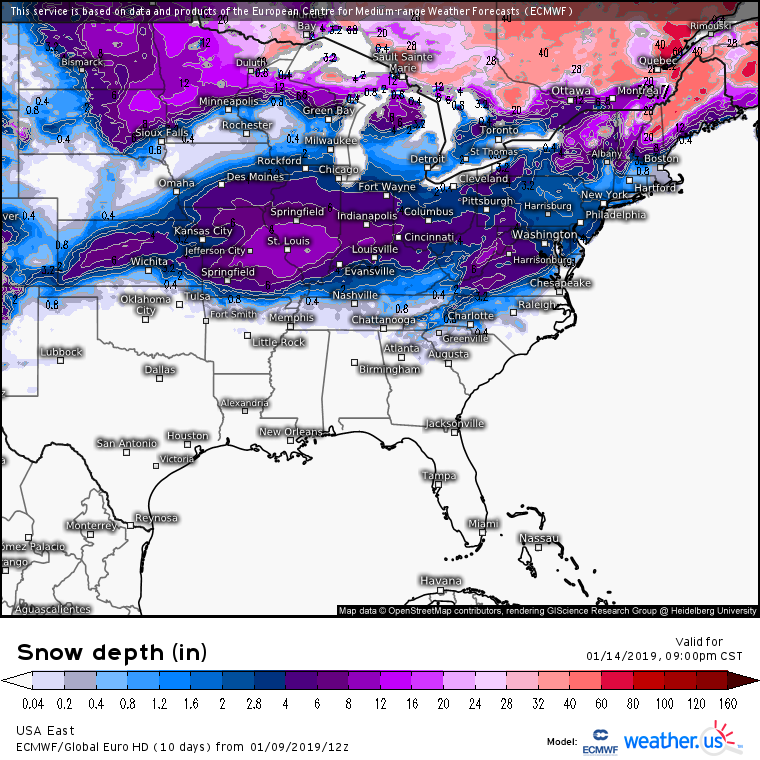 Along the Ohio River into Illinois will have 1-6 inches of snow with local 10 inch amounts. This includes Cincy, Louisville, Springfield, Evansville and St. Louis. 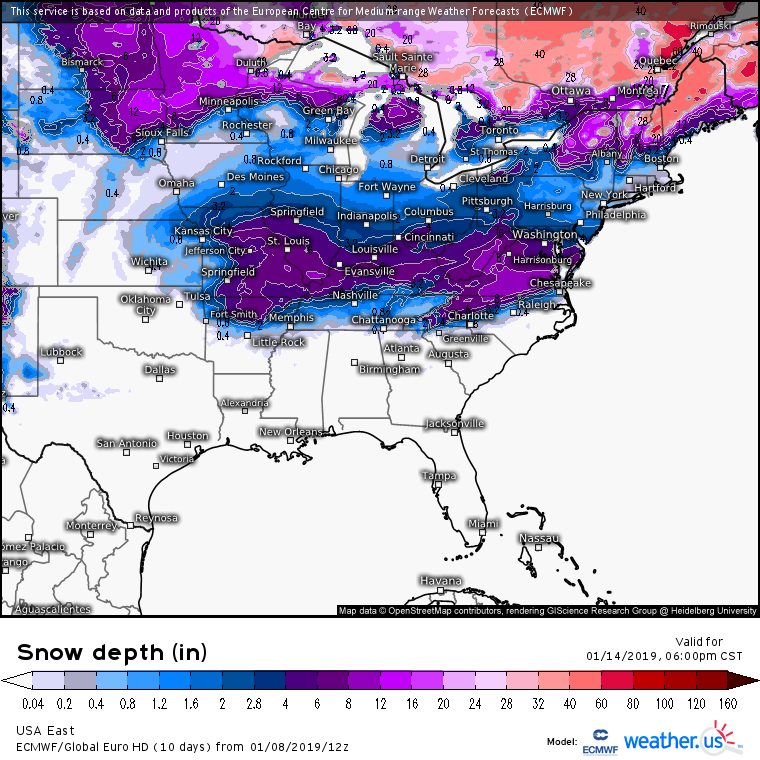 I can see 15 inches of snow across south-central Missouri. 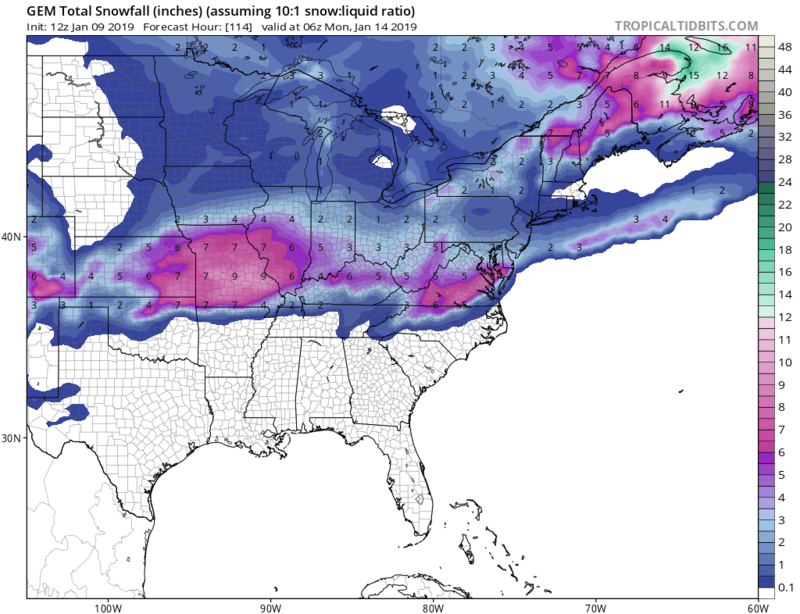 Remember, this storm was not even on the maps until Sunday afternoon when the GFS first showed the storm. While not a true Big Daddy but a typically January snow event. 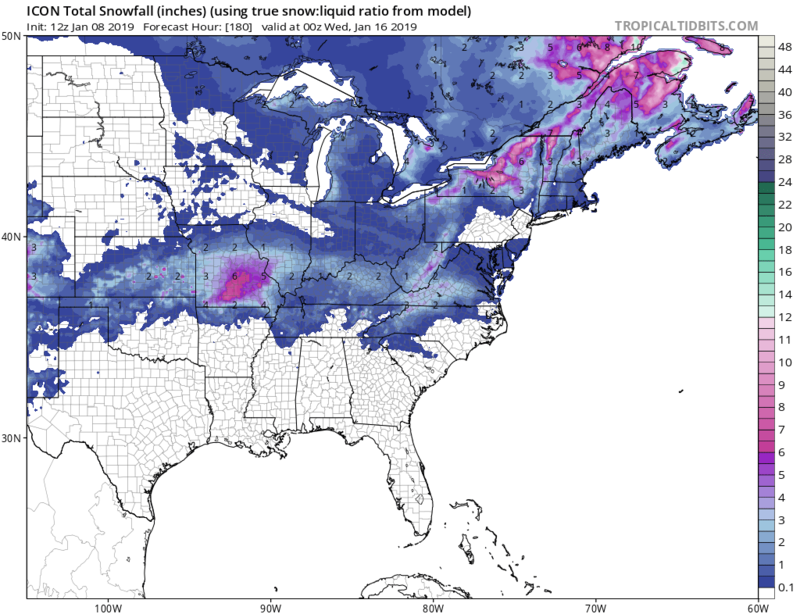 4:00pm Wednesday January 9, 2019 – The models still remain in agreement on the snow event coming this weekend. As mentioned yesterday, it’s a squeeze play of snow coming east from the Mississippi Valley. Parts of that area, especially southern Missouri will be get up to a foot of snow Saturday. 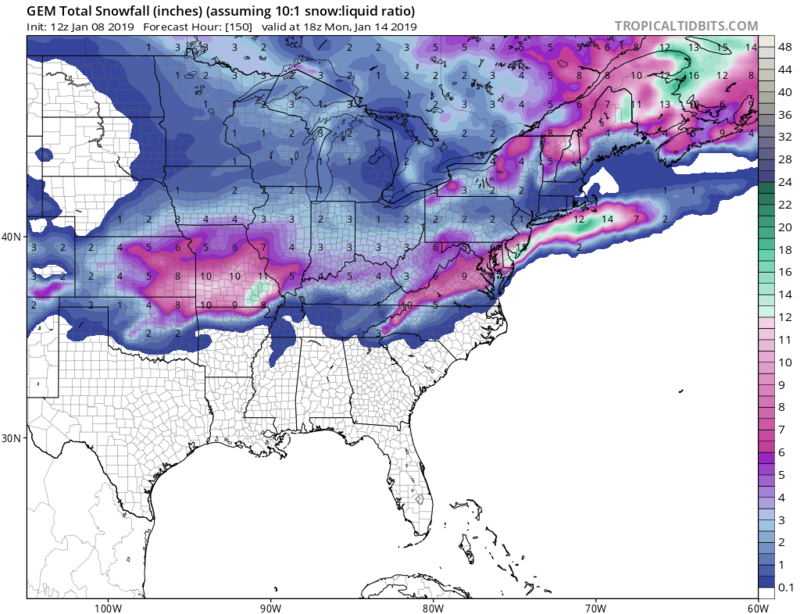 Despite the models, I still think snow will get up to NYC and Philly with NYC having 1-3 and Philly 3-5. 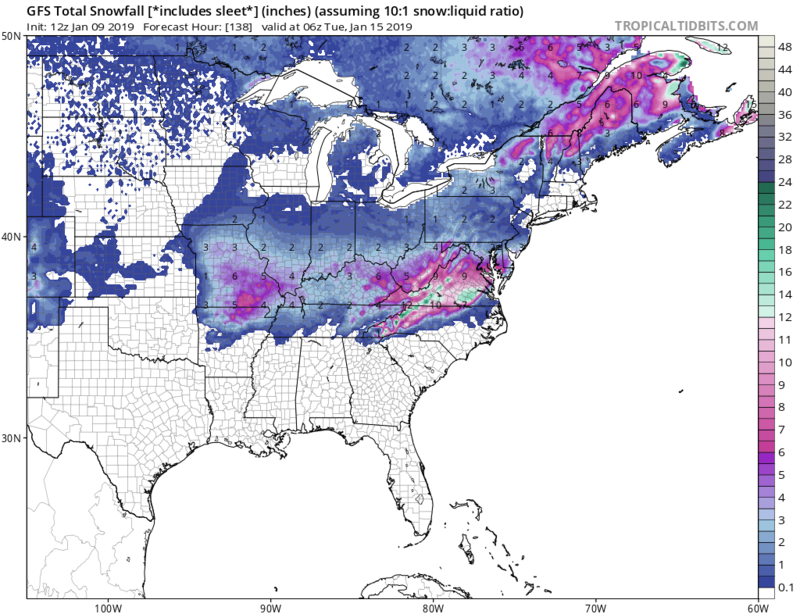 Virginia into The Delmarva will see 1-8 inches of snow and we should see that in the Ohio Valley as well. 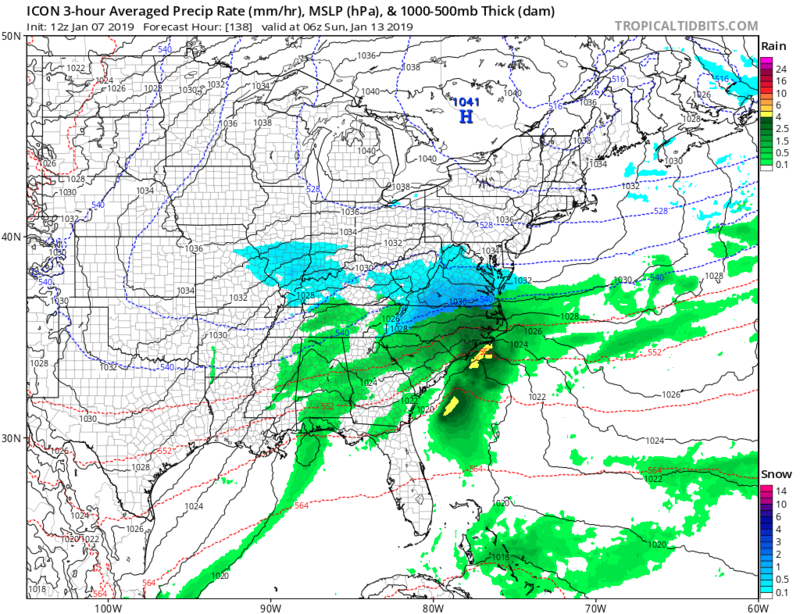 4:00pm Tuesday January 8, 2019 – I like seeing all the models coming into agreement now on the snowstorm coming. 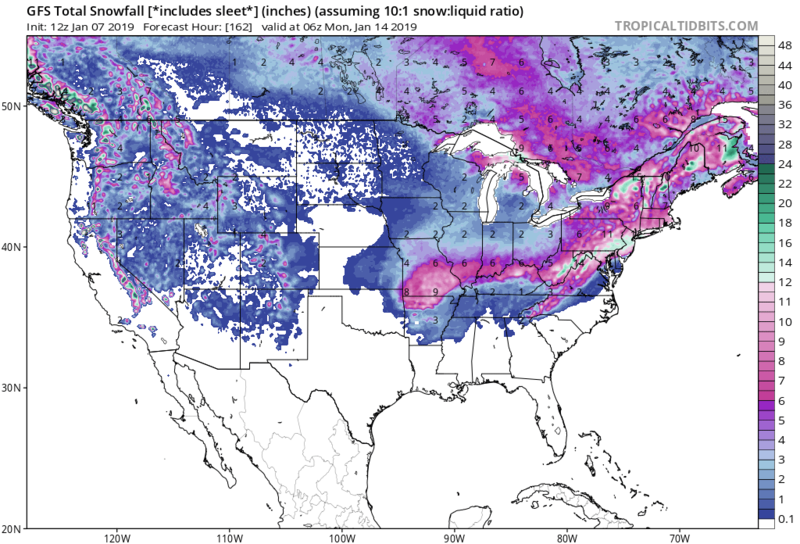 Even the ECMWF decided to join the snow-fun showing a swath of moderate snows from the mid-Mississippi Valley to The Delmarva. The models are having to struggle with a confluence flow where the snow area is being squeezed into the two troughs that are trying to converge. I do think the error today is the southern extent of the snow. 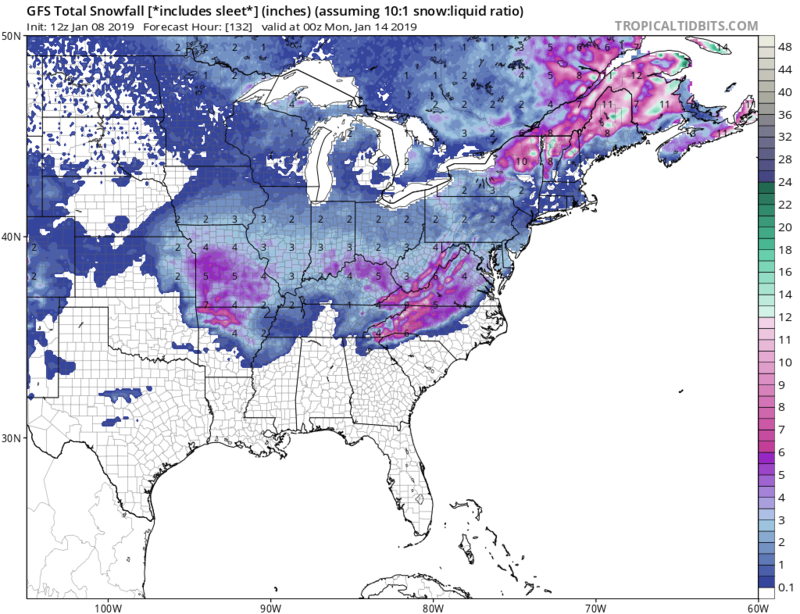 I do think snow will end up coming more north hitting Philly and NYC with moderate snows. It does appear that Baltimore and Washington will see 1-6 inches of snow. Missouri seems to be the area where heavy snow will occur with up to 12 inches in places around Joplin and Springfield into the Ozarks. Even cities along the Ohio River up to Cincy may see 1-6 inches of snow out of the storm. 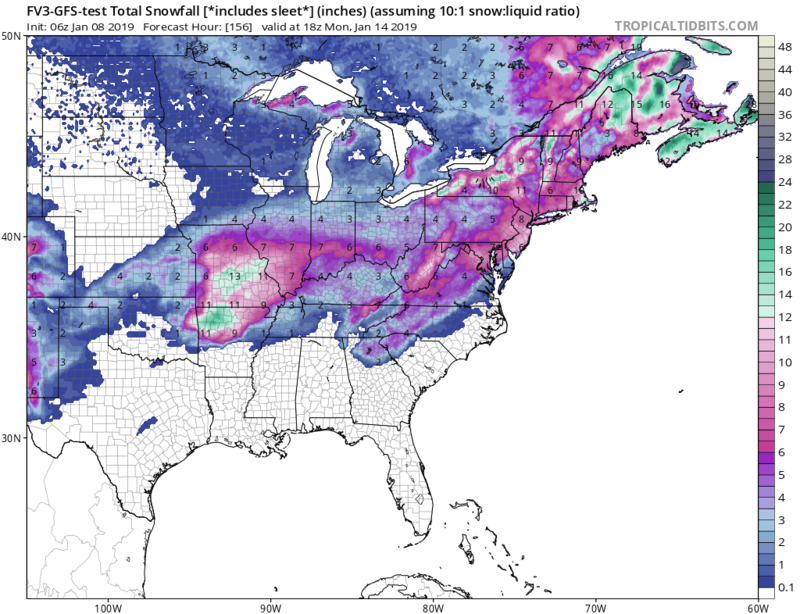 Lexington and Louisville may see up to 8 inches of snow out of the storm. 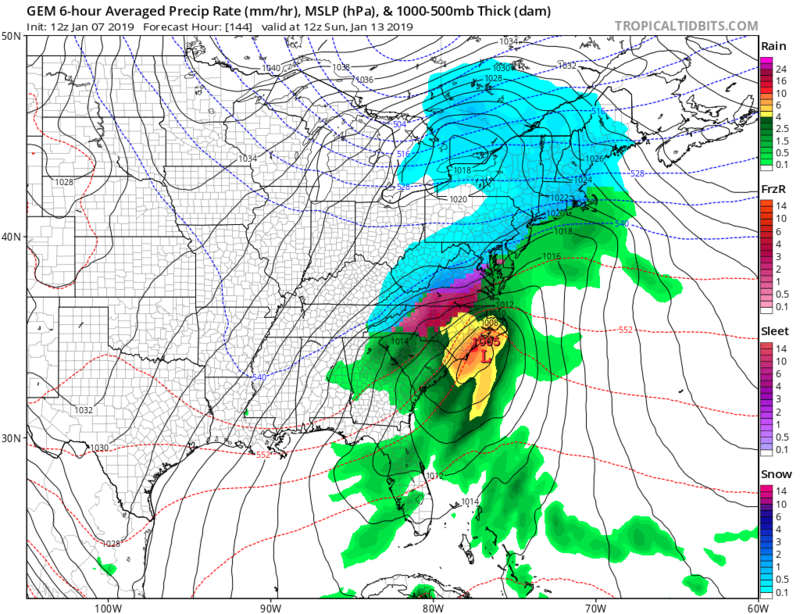 4:00am Tuesday January 8, 2019 – gfs remains on target with the storm ecmwf still lacking any snow event but thinking that will change today. 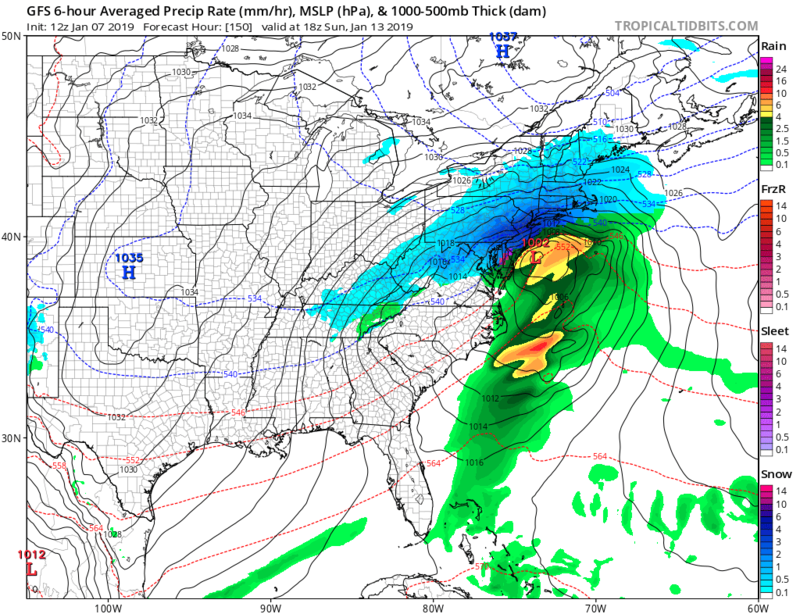 I like the cmc model depiction below for the storm. 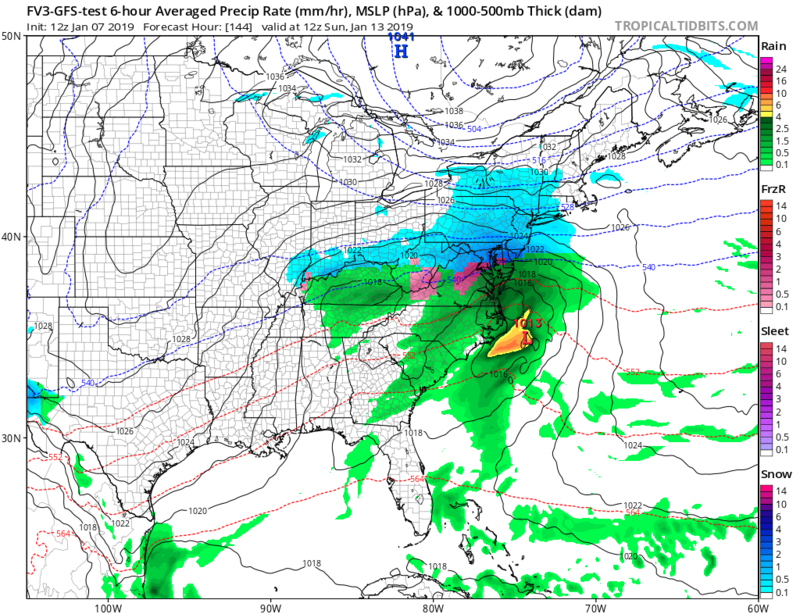 3:00 pm Monday January 7, 2019 – GFS remains the model of choice with major snow event cutting across the Ohio Valley into the Northeast. 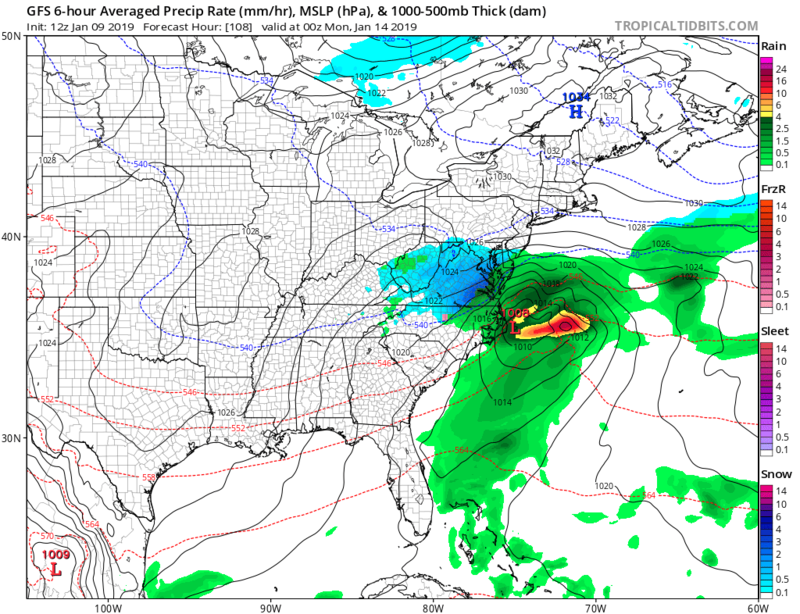 The other models seem to be coming into agreement with the storm with the exception of the ECMWF which has much weaker storm moving off the North Carolina coast. 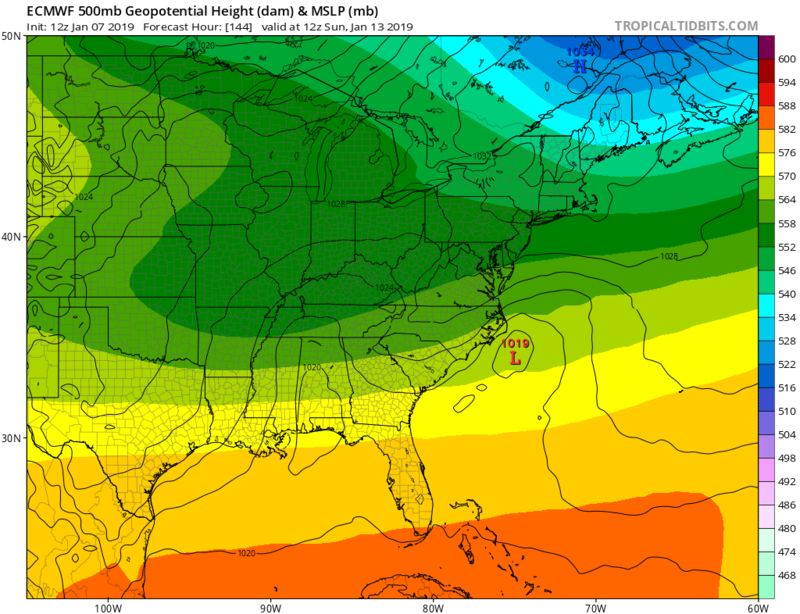 I am thinking there is a compromise coming between the GFS all-out snow event and the weaker ECMWF solution. With that said, I am starting to think a swath of snow starts in Arkansas/Missouri and heads to southern New England. While the width of the snow area may not change, the amounts may as the storm hits the East coast. One should be concerned for the major cities this time from DC to Boston with Philly and NYC perhaps in the midst of the major snows. 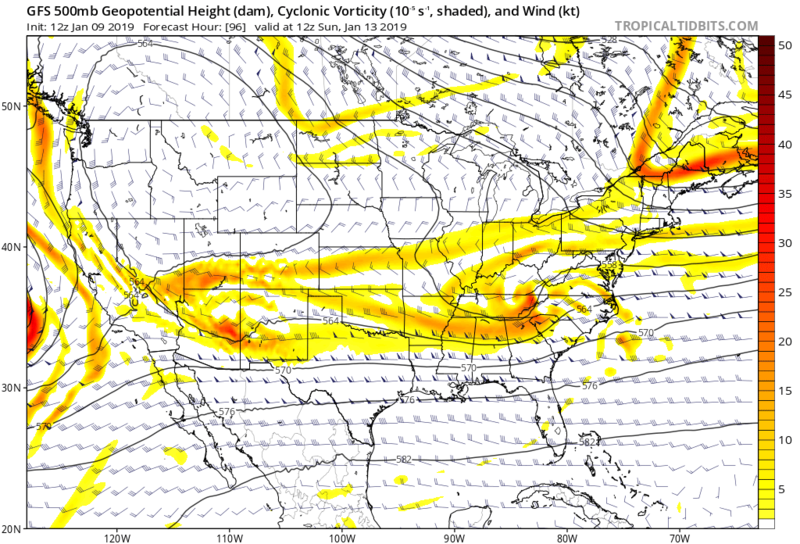 Sometimes these weaker storms are the bigger events with it comes to snow and this could be one. Still a lot of time for changes in the modeling, but I must say my excitement for snow is gearing up after a dreadful dull December. Daily Video: Tight Squeeze of Snow! Im hoping I see the Big Daddy hat by friday ! 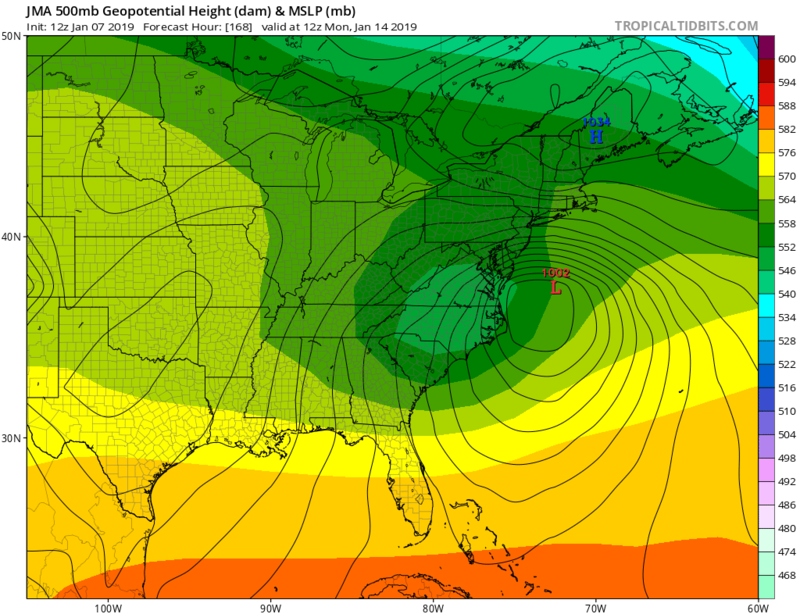 Strange looking 18z GFS run; shoves storm out to sea, missing philly, nyc and Boston. Is this a repeat of NC December snowstorm? The models will adjust several times over the next couple of days.